One of you lucky readers is going to win an apron from Jessie Steele. Jessie Steele aprons were created by a mother and daughter after collecting vintage aprons for years. They combined the vintage charm and style with a 21st century fit and appeal. 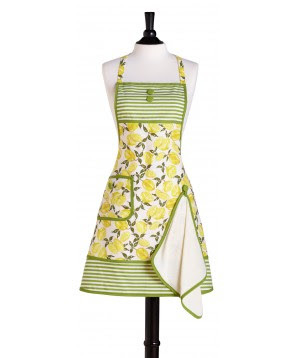 These aprons are not only beautiful and feminine, they are designed to make the woman who wears them look and feel good. 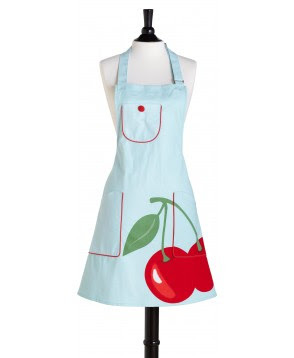 They have a huge selection of hostess, chef and children's aprons. I especially love viewing them in collections with matching towels, pot holders and oven mitts. I know you want one. 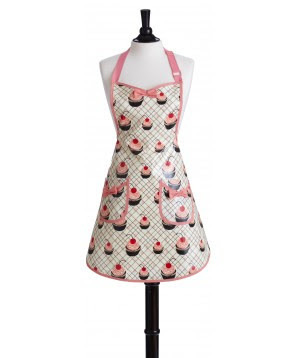 Jessie Steele is giving away this fabulous Cream and Black Damask Chef Apron. It's a durable sturdy apron with tons of style. You know how much that means to me. 1) Leave a comment and tell me what you think is the #1 quality in an apron. Make sure to leave your email address. 2) For a second entry visit Jessie Steele on facebook and like them, then leave me a comment telling me you did it. Giveaway ends Sunday March 13th at 10pm MST. 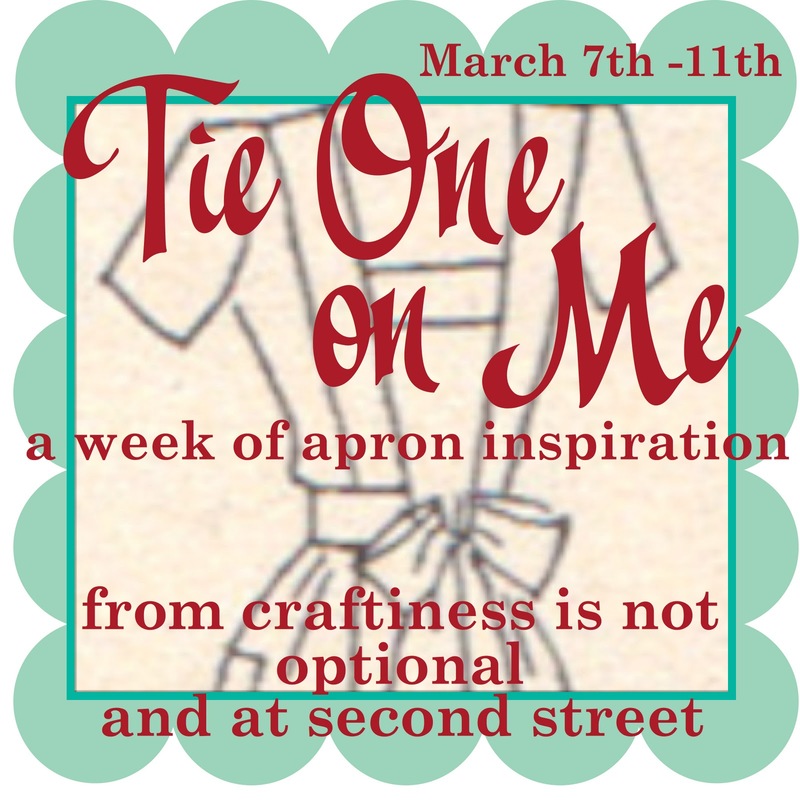 Thanks for being part of our week of apron inspiration. 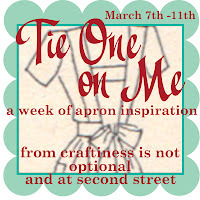 Enter the Imperfect Apron Giveaway HERE, and Jess's apron pattern giveaways HERE. Good quality and cuteness are tied. I want something that lasts but I also want something I love to wear. My aprons need to have full coverage- top to bottom, side to side. Not only am I messy, but so are my short-stature helpers. Thanks! I would say cuteness for sure, and that it washes well. these ones are SO adorable! I also liked on facebook! yeah, cuteness. :) My aprons hang for everyone to see, so it's important that they look good. haha. durability is definitely first on the list, but cuteness is a very close second. :) Oh, and pockets...I love an apron with pockets! I love a cute apron - but it has to be sturdy & fit right. All of the cuteness in the world doesn't make up for a flimsy apron. I like Jesse Steele on FB. What I love about an apron...I like if it is comfortable, wide enough to tie around my plus size waist and good coverage so that I am still not wearing flour after taking it off. I follow Jessie Steel on Facebook. It has to be easy to put on! I don't want several ties that need to be done each time. It looks like this one has a halter top, which is so much easier! It have to be durable and cute for me to love it! It need to be a good quality but it has to be cute! My current apron is solid black and boring! I like Jessie Steele on Facebook! It's got to be tough! I need an apron that covers me from side to side. I'm a very messy baker! Gorgeous aprons. I would say that it covers me and is super cute. I'm a personal chef, I do a lot of cooking and want to look cute in my aprons. I "liked" Jessie Steele on facebook. gotta go for the cute! For me, the #1 factor is all about cuteness! 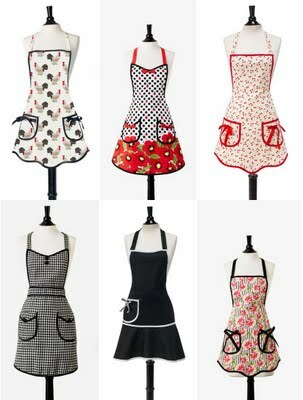 I have aprons that I want to just wear as part of my outfit because they are so cute. I also liked the aprons on FB! cute with lots of pockets. I love these vintage inspired aprons. They remind me of visiting my Grandmother who wore an apron every day. I'm short and small, so adjustability is big for me! that apron is so cute! i think that an adjustable neck strap is the most important part of an apron, because i hate having to stick a safety pin up there or tie a knot in it because it doesn't fit right. maybe i'm just mis-shapen. either way, love this apron! i "liked" jessie steele on facebook! I had to think about this! I have to say the fit is important because if the apron makes me feel in-proportionate, I won't wear it. Fit would be important to me!! Especially since you're moving around a lot & will be bending down. I love the green & white damask! Thank you for the opportunity!! I think that the #1 quality of this apron is definately the cute print! The pockets will come in handy too! I want an apron that is both pretty and also made of durable fabric, no sense if it looses its structure after one much needed wash. I love it! So beautiful! I think my favorite quality in an apron is the perfect balance of functionality and beauty. I am very old fashioned, mainly because I grew up with my British grandmother living in the house with us - she always wore an apron, and nothing plain, always a beautiful vintage apron. When Grandma would "tidy up" she would put things in her pockets until she found a home for them (mostly MY bobby pins that were scattered thoughout the house). of course the most important thing is keeping you clean, but I think you want the second thing, so I would say comfort. I have an apron that is uncomfortable so I don't wear it as often as I would. The most important thing for me when I look to purchase an apron is if it looks good! If I have company for a meal or party, I want to look cute, not "grandmaish". I like Jessie Steel on FB! I think it would have to be style, I want something that will make me feel like I look good no matter what I'm doing in it. Well if I was sensible I'd say washability - I want to be able throw it into the washer and dryer without worrying. But really it's the look of it! And the prize apron is gorgeous. those aprons are gorgeous! i would love to win one. i love aprons because you can look cute while doing housework. Definitelly the cuteness factor, and I'm not even ashamed to say it!! Thanks for the fun giveaway! and inspirational week! Full coverage! My hubby always laughs at shirt being covered in flour. 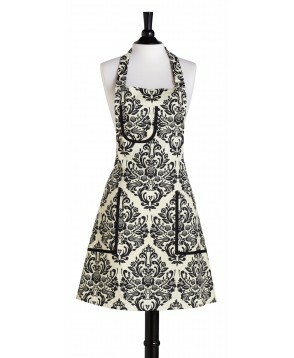 I love black, white and damask, so I love this apron. Thanks for the chance to win. I liked Jessie Steele on FB. Cute apron! I think it's important not to look like my grandma's apron (sorry grandma) and if it's easy to get on and off! Ties long enough to wrap all the way to the front and give me something to hang my towel on. I would love an apron to be something I would love to put on everyday when I'm cooking! It has to fit well on your chest. Sometimes if they are too loose you can lose some stuff down it!!! Thanks for the giveaway! Durability. I want it to wash up well so I can keep using it. What good is an apron if it looks good once and can't be worn again? Durability... Fabric... and Cuteness! I love aprons, and want one that will last! Definitely Cuteness! Anyone can tie a towel around their waste to be practical, but I like to feel cute even if I'm working in the kitchen. So cute aprons like Jessie Steele's are a MUST HAVE!! Aprons... they save clothing! And look super cute. I'm a new fan at Facebook too! an apron that covers everything! It has to be cute, cute, cute! I think it has to be style. I want the apron to make me feel special and inspired. I think food turns out better when you feel good fixing it! Number one quality in an apron is that it has to fully cover my shirt. I'm quite messy in the kitchen. I found Jesse Steele on Facebook and liked them! Thanks for this giveaway! Wash and wear durability, followed by cuteness then pockets! Growing my collection of aprons this year, would love to claim a Jessie Steele apron as mine. I liked Jessie on FB. I think the 1# things about aprons is their usefulness - those aprons thats look good but also have lots of practical uses including pockets and hidden sections...I just love them! I "like" Jessie Steele on Facebook! #1 Quality? Machine washable!! It seems like a given, but I just don't do hand washing. Quality is number 1 but a being pretty is a close 2nd. To be very feminine , have plenty of pocket space and have great all over coverage from the messes of cooking. Thanks for sharing the giveaway. The main thing is for it to keep me from getting so messy- but who wants to bother with putting on an apron unless it's super cute!! I love aprons! Mine have to super cute! haha! I think the most important thing to me is style. I want it to be fun and flattering so I can be cooking and hosting and feel cute all at the same time! I also liked Jessie on Facebook. Liked Jesse on FB. Man thanks for turning me on to aprons & accessories to match my vintage wannabe style. I love an apron with a pocket and one that has ruffles. I love how an apron makes me feel. All creative and domestic at the same time! It has to be cute and I LOVE pockets! I love cute aprons, but it also needs to be washable. Thanks for the contest! I love that apron! I think the most important quality is for it to hold up to repeated washings. Absolutely how super cute they are! And you bet I'll be back after I 'like' them on facebook. Love ya, Kalleen! Too bad the best I could do was 'like' them, not 'love' them. But they are liked (on fb) now nonetheless. For me, it has to be functional and comfortable to wear so it doesn't get in the way. But these are super cute and that is such a bonus! I like Jessie Steele on facebook. The most important thing about an apron is that it is durable and won't come apart in my washing machine. Yeah that just happened to me this week. ugh! Quality fabric is number 1! It needs to be able to get dirty, washed and worn numerous times and still be able to look nice. It also needs the right type of fabric that will dry my hands and not have beads of water dripping off of it. The cute cut. Seriously. Wanna look like a WOMAN. I just FANd them on facebook. YAY! Probably would've done it anyway, but this was good motivation. The important part for me in an apron is to cover the whole chest part. The number one quality in an apron for me is comfort. Cuteness doesn't hurt either! I liked Jessie Steele on Facebook. I love pretty aprons, plus its a bonus if they're machine washable. I suppose it must be washable and still look great afterwards. I really need this cute apron because it would make me look like a cute young thing in the kitchen instead of a granny, plus it is my favorite color combo of black and white and so is my kitchen! The #1 quality in an apron is style! It could be a dish towel wrapped around your waist otherwise. And Jessie Steel certainly wins in the style department. I liked Jessie Steele on Facebook!